Airmatics can accurately size your compressed air system using your existing compressor by tracking the usage for one week. Our logger is easily connected and not only will we be able to size your next machine correctly; having seen exactly how your air usage is throughout a typical week, will be able to suggest improvements to your system to save you downtime and wasted money on either excessive service costs. ​By implementing the correct sized variable speed screw compressor, we are able to ensure your system runs at its optimal during your production. ​We are also usually able to see how much of your air goes to leaks and maintaining air in your factory. Old systems with excessive leaks cost thousands per year in added running costs and this cost can be demonstrated with our data logging reporting. ​Another example of savings is by installing a much smaller compressor used to only maintain system pressure during low usage periods. Say for example in a large factory where there are critical components that require air supply 24/7. Overnight there may only be a minimal amount of usage say 5% of the system capacity. By installing a smaller unit to handle the low usage periods overnight, this will not only prolong the life of the main load compressor by eliminating the overnight running time but will also save money with the ability of implementing longer service intervals. Enquire about sizing your compressed air system today!!! The data we gather is the usage from your factory. So when we say we select the best sized compressor for you, we mean it. Not for a similar sized factory. The collected results allow us to check and estimate if and where there are any savings to be made by making changes to your compressor system. This is typically done by installing a variable speed drive unit as well as rectifying excessive leaks through your factory. 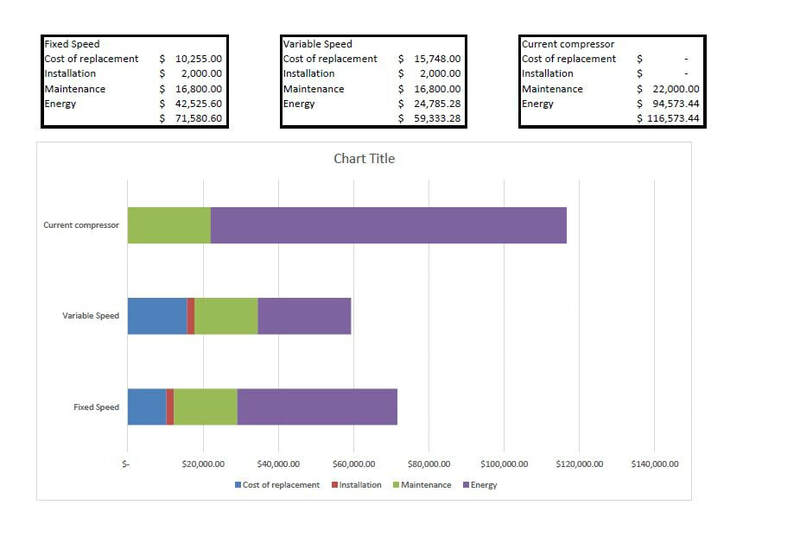 This gives you an idea of how much you will spend on your compressor system over a ten year period. You will be able to see where the bulk of the savings are made.